Awww, wook at all the angwy Putinists, trying to change the subject – they're so vewwy angwy!! It's cute ???? We don't censor; just highlight. We'll consider revealing our names when Russia reveals the names of those running its propaganda operations in the West ???? 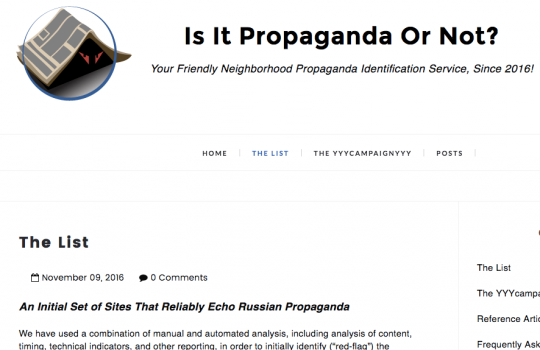 Timberg’s piece on the supposed ubiquity of Russian propaganda is misleading in several other ways. The other primary “expert” upon which the article relies is Clint Watts, a fellow at the Foreign Policy Research Institute, a pro-Western think tank whose board of advisors includes neoconservative figures like infamous orientalist scholar Bernard Lewis and pro-imperialist Robert D. Kaplan, the latter of whom served on the U.S. government’s Defense Policy Board.